Clarets boss Sean Dyche has backed centre back Michael Keane to make the step up to the England squad. Keane missed out on selection on Sunday night, as Gareth Southgate named his first pool of players, following Sam Allardyce’s departure, for the World Cup qualifiers against Malta on Saturday and Slovenia on Tuesday. Team-mate Tom Heaton was again named as one of the three goalkeepers, but Keane, who played under Southgate at Under 21 level, will have to wait for his chance. Dyche said: “That’s up to Gareth, he’s had him in the Under 21s, but I don’t think he played him in the last tournament, so whether or not he’s changed his mind on that, with the experience he’s gained since then, I don’t know that, that’s down to Gareth. Keane was again outstanding in Sunday’s 1-0 defeat at home to Arsenal, as the Gunners cruelly nicked an added time winner, with Laurent Koscielny possibly off-side, but certainly handling the ball in. 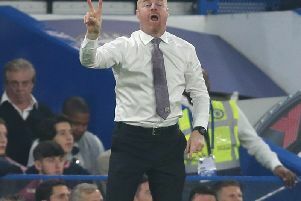 And Dyche added: “I think there were a number of good performances, that’s why there’s frustration in the outcome, but I’ve got to look at my players and what they’re giving me and each other. “There’s no question they give a lot, in their performances and their will and demand, and that drive it takes to win games. “We know we’re not market leaders, we’re the minnows of the division – you’ve seen our spending power compared to everyone else, but that doesn’t mean we don’t want to take on the challenge because you’ve seen that in abundance. “I think we’re moving forward, adapting to the Premier League quicker than we did last time – there’s an inner belief in the performances. “I think they understand the challenge – there’s an awareness of that, and they know – playing well didn’t get us anything today, so the next one you have to go and play well again, and you might not get anything from that, but you’ve got to play well and win games. “If you don’t play well, you’ve got to win games, we know that, points on the board is the outcome we’re looking for, and we’re going about it in as many different ways as we can. Summer signing Johann Berg Gudmundsson is beginning to show why Dyche brought him to Turf Moor from Charlton Athletic and he said: “I thought Johann played well, really well, he’s beginning to get it. “Defour tired quickly, that’s why we took him off, he’s still adjusting – I’ve said that, even when you’re all waxing lyrical, I’ve no problem with that, but he is adapting still.